The healthcare system is highly complex and heavily regulated, so it isn’t surprising that it has a reputation for being slow to change and in no hurry to accept new innovations, particularly when it comes to information technology. Moving to electronic medical records, for example, seemed to be a task of Herculean proportion. But once in a while, a technology comes along that has so much potential to benefit patients and providers alike that it is adopted and integrated into the system much more quickly. Telemedicine is one such solution. 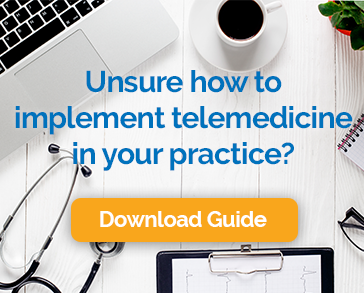 One could argue that telemedicine has been around since the invention of the telephone. Doctors at a distance spoke to each other about patient cases and soon even sent images back and forth. The approach was even used by NASA in the 1960’s to provide care for astronauts orbiting the earth. During the 70’s, 80’s and 90’s, hospitals used specialized video conferencing equipment to connect specialists in one location with doctors and patients in another. But the true potential for telemedicine to impact the healthcare system didn’t really become unleashed until the recent spike in the availability of high-speed internet connections and mobile devices with high-definition video capabilities. The fact is many consumers are now walking around with technology in their pocket that rivals the expensive and difficult to use video conferencing systems of the past. That has changed the game. Today, many people see their healthcare provider via video visit from wherever they happen to be. Traditional medical practices have added the option of telemedicine for patients, and a new type of online-only practice has emerged. Telemedicine is used for everything from routine management of medications and follow-up visits, to post-hospitalization care and mental health. Insurers and state regulators recognize the benefits of telemedicine for patients and are expanding the ways that providers can be reimbursed for this type of care. Thirty states now have some sort of law on the books that requires private payers to reimburse providers for telehealth in one way or another. Often, these laws require parity in payment between in-office and video visits. States that once required that an in-person relationship be established before medication could be prescribed based on a telehealth encounter are starting to reverse those restrictions. In many states, reimbursement is available for patients on Medicaid. While Medicare still generally operates on a hub and spoke model, requiring that the patient be at a designated care site, there are signs that is starting to change. Restrictions have been relaxed for patients in rural and underserved areas, and the Medicare Chronic Care Management program provides reimbursement for providers enrolled in a program to help patients with multiple chronic conditions. All available evidence points to the fact that the use of telehealth technologies will continue to escalate. Spending on related technologies was up in 2016 and providers report either active projects or great interest in integrating telemedicine. Consumers increasingly say that the availability of telemedicine is a factor in choosing their providers. In addition to increased demand for video visits, other related technologies are becoming advanced enough to be part of the mix. Wearable devices, for example, can be used to measure vital signs, activity levels, and even stress levels. This data can be shared with providers in real time. This approach has a number of applications, for example, the ability to release patients from the hospital sooner without increasing the risk of readmission or helping elderly people stay in their homes longer. The European Union is already testing out artificial intelligence applications to help immigrants navigate a complex healthcare system and eliminate language barriers. Technologists are working on applications that will enable smart home devices, like Amazon’s Alexa, to remind patients when to take their medications and answer health questions. As technology continues to advance, we will see even more remote manipulation of equipment, including the ability to take diagnostic images or even perform surgery at a distance. What’s happening today is remarkable, what will be possible is astonishing. The United States faces difficult healthcare challenges in the years ahead. We have a rapidly aging population and an increasing number of people with chronic conditions. On top of that there is a provider shortage that is only forecast to get worse. Telemedicine isn’t the only approach needed to address these issues, but it can go a long way in ensuring access to quality care for all Americans. As the conversation about the future of healthcare in the US continues, we have no doubt that much of it will revolve around telehealth.